The event has been the culmination and labor of love from members who met through the popular Facebook group, Show Me Your Stethoscope. Founded by Janie Harvey Garner in response to the "doctor stethoscope" comment on ABC's "The View," the group has grown to more than 650,000 members and continues to be the growing grass roots movement for a nation of nurses. "Nurses are the largest workforce in healthcare and yet have the smallest influence on healthcare policy," says Garner. "Raising public awareness of the dangerous staffing levels can only help us. The public must join us in this fight because nurses are threatened and fired for advocacy. The most trusted profession on the planet is punished for advocating for the patients under our care. Also, our nursing programs failed to teach us how to advocate for ourselves." 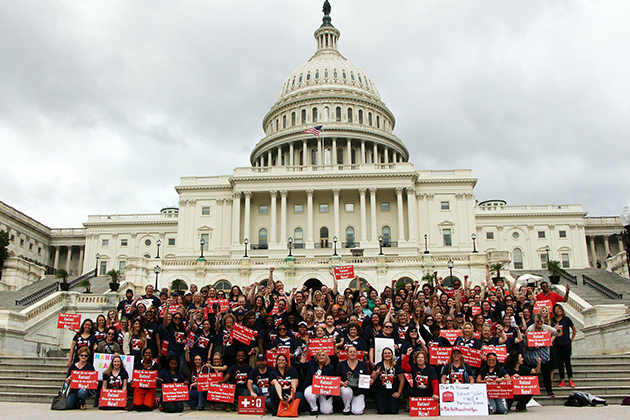 "My goal of the event is that nurses feel confident and motivated to connect with their legislators," organizer Cathy Stokes says, "as well as to empower the nurses and help them realize that they bring value to the profession and bedside. And that we as a united profession, we can make the positive differences that are needed." "Arguably the biggest problem in achieving 'enough nurses' is not that we lack evidence of the difference they make or that we have insufficient information to determine the numbers needed, or the conditions associated with attracting and retaining nurses," Author Jane Ball remarked. "And it's not that we have failed to share the evidence. "It's a systemwide failure to fully comprehend the unique value of the skilled care provided by RNs. If the contribution of RNs is not valued, the RN workforce is not planned with diligence, nursing shortages arise, and staffing levels are lower than they need to be to provide care safely and effectively." Organizer Doris Carroll added: "I wonder — what will be our watershed moment for nurses to take action and demand a rewrite of safe staffing levels? I believe the time is now. In fact, it's critical."